ChatBotlr allows guests to text service requests as well as obtain information about the hotel, listen to the brand’s #AloftLive playlist and connect with the front desk. Marriott recognized the growing popularity of text messaging when it launched the Mobile Requests feature on the Marriott Mobile app in 2015, enabling guests to chat directly with hotel associates. Since then, 2.5 million requests have been received with more than half coming before guests checked in. The success of Mobile Requests inspired Marriott to expand the number of guest-facing mobile communications options, including chatbots for its Marriott Rewards members. Marriott Rewards chatbots are available on Facebook Messenger, Slack and soon, We-Chat and Google Assistant. Marriott Rewards members on Facebook Messenger and Slack can research and book travel at more than 4,700 hotels, link their Marriott Rewards and SPG accounts, and chat directly with Customer Engagement Center associates. According to Marriott, of the guests using Marriott Rewards’ Facebook Messenger this year, 44 percent received stay-related customer service such as changes to their reservation and 53 percent found assistance related to their Rewards account such as how to redeem points for stays. 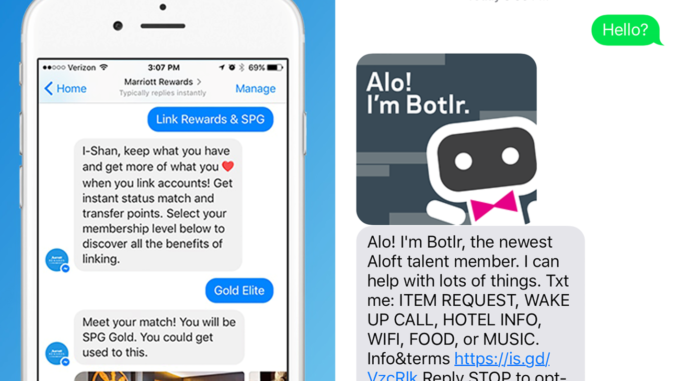 Now Aloft Hotels, which is part of Marriott International and currently numbers 110 hotels in nearly 20 countries, has launched the first ChatBotlr, a new chatbot available via text message that gives guests an additional way to make service requests. Aloft introduced the first generation Botlr, a robotic butler, in 2014 as a pilot program to allow front desk associates to respond more immediately to guest needs. This next evolution of Botlr, the ChatBotlr allows guests to text service requests as well as obtain information about the hotel, listen to the brand’s #AloftLive playlist and connect with the front desk team during their stay, even when the guest is not on-property. By leveraging natural language understanding and machine learning, ChatBotlr reportedly gets smarter the more it interacts with guests. Early findings show that 2 out of 3 Aloft guests are interacting or making requests with ChatBotlr and the service has a five-second response time. In general, Chatbots enhance the quality of the guest experience by enabling guests to ask basic questions, make simple requests, and receive instant responses. They also free associates on property from routine tasks.